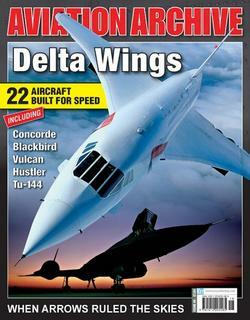 ‘Delta Wings’ is No 40 in the successful Aviation Archive magazine series. It is the fascinating story of delta-winged aircraft, from experimental test-beds to the undisputed fastest aircraft on the planet. A supersonic story guaranteed to set the pulses racing, it features unparalleled photographic coverage, including many exclusive and rare shots that have never been seen before. Pick up your copy now, direct from our website or in WHSmith and other leading newsagents. UK customer? Click here - - to find your nearest Aviation Archive stockist.